With businesses cutting back on budgets - the office holiday party could be the next cut. Rather than canceling the party, a humorous employee awards ceremony could lighten the mood this year - and save money. A new book by corporate comedian Larry Weaver tells how. Durham, NC (PRWEB) November 6, 2008 -- The holidays are coming and businesses are looking for office party ideas to fit their budget. In addition, with a tighter economy, employees may need some cheering up. While some opt to cancel the party, comedian Larry Weaver invites people to lighten up instead. His new book, "Funny Employee Awards: Your Complete Guide to Organizing a Humorous, Entertaining, and Rewarding Recognition Ceremony," tells how to plan a fun and entertaining party. As a professional comedian, Weaver has seen way too many holiday parties serious - and boring company parties. He has vowed to prevent employees all over the country from going to yet another boring party out of sheer obligation. Instead, giving out funny awards certificates recognizes the unique personalities and contributions of each employee. "At most office parties there is a supervisor who rattles off a laundry list of people who have won awards. There is polite applause and everyone is wondering how when they can leave without looking bad," he said. Another thing, no one feels special. "Very few company awards shows make employees feel good. That's why I wrote this book. I knew with a little creativity awards ceremonies could make people laugh. They can bring people together during what is for many, a stressful year," Weaver said. Anyone who's tried to come up with their own funny awards knows that coming up with ideas and making them look good is the toughest part. Weaver once got assigned the task to come up with them for a company he worked for. With his ideas anyone can put on a successful awards ceremony. The awards have references to pop culture, world history, classic literature, children's characters, and more. There are awards for teamwork, leadership, departments, and for a job well done. They range from the congratulatory to the silly or clever. Most of the awards "poke light fun." Weaver encourages companies to only give those awards to the employees with a sense of humor. "Funny employee awards are meant to entertain people, not embarrass them. I explain how to use humor that will even make human resources smile," he said. These awards are meant to take any manager and make them look like a pro on stage. 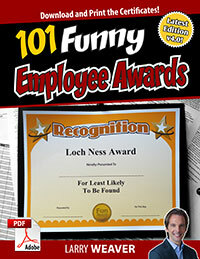 "Funny Employee Awards" includes 101 professionally designed printable award certificates that can be downloaded and printed at the office. 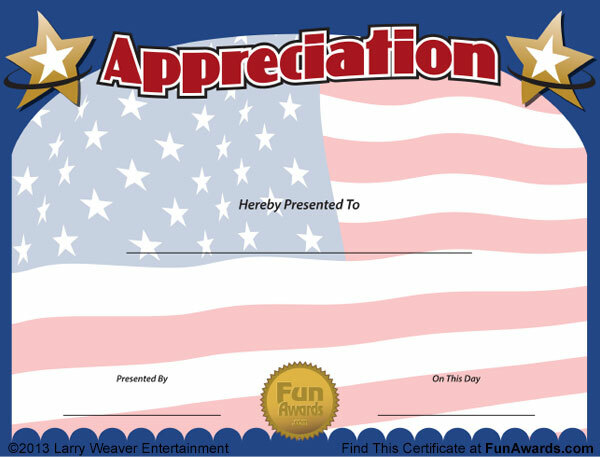 As a bonus, there are six blank award templates that can be turned into custom awards. About Larry Weaver: Larry Weaver is a professional comedian and creator of the Funny Employee Awards Show - the company party where your employees are the stars. With nearly 20 years as both a corporate comedian and office worker, Larry brings a unique and refreshing perspective to workplace humor. The Funny Employee Awards blog has stories from successful or humorous office parties around the world.